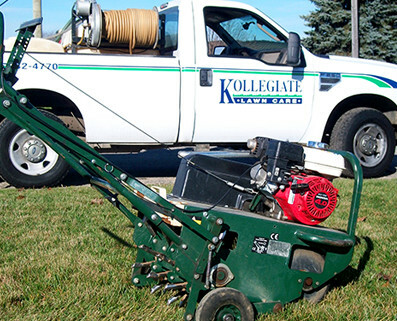 Why choose Kollegiate Lawn Care? Our programs are based on a study of soils and the relationship in developing and maintaining healthy turf through the use of quality fertilizer and micro nutrients to amend soil deficiencies. We believe in continuous education to remain current of research within the industry, to better improve our service. We are locally owned and operated (licensed and insured). Our team has over 50 years of experience with lawn and tree care. Our winter office hours are Monday - Friday: 7AM - 5PM, closed on Saturday & Sunday. The Kollegiate Lawn Care name was chosen because we believe in a higher level of education and professional service. Every year we take courses and attend seminars to improve our knowledge and service. Kollegiate Lawn Care provides lawn services in the Kitchener/Waterloo and surrounding areas. We are locally owned and operated. Since 1977 we have studied this field and we strive to educate our clients. We have the experience and knowledge that we are sure you will appreciate. We Guarantee all our work.